I recently earned two B.S. degrees in Math and Physics, where I focused intently on detail, and deep understanding. I would study until I could prove my way through my books, and reconstruct results using my understanding and logic. Nothing gives me greater satisfaction than sharing this understanding with other people. I specialize in subjects where students are expected to prove results in math, and require a strong conceptual understanding, as well as technical. I've worked as a TA for an freshman Electricity and Magnetism course based on vector calculus, and ran a small discussion session focused on problem solving. Working with students who were new to university level physics helped me learn the psychology of teaching, and strategies for helping students learn sophisticated mathematics/physics. Many people know how to solve problems in advanced math classes, but I have a deep understanding of the theory itself. I have spent countless hours proving the main theorems in the book, not only the ones in the problems sections (I prove those too). I see the connections between different fields in mathematics, and find that I can share exciting insights with students that they may have never heard elsewhere. I love working with learners, and would be happy to show you not just how to complete your math work, but how to see the beauty in it. Please feel free to contact me to learn more about my lessons, or schedule one for yourself. I have earned a dual Math/Physics B.S. degree with a 3.7 GPA. Teaching learners of all kinds, especially those that do not think themselves able, is my passion. The complete, overall picture I have of Math helps me to point students where they need to go, make connections to other things they have learned, and detect precisely misunderstandings they may have. Instilling confidence in learners is a great reward, and I am proud of my patience, and supportive affect. Algebra 2 is one of the staples of mathematics. I have extensive experience working with a diverse body of students with varying needs, and levels of experience. Some students learn algebra 2 in high school, others are taking it in college. No matter the student's needs, I can customize my curriculum to assist. I have taken the regular Calc I, II, III calculus sequence, as well as more advanced real analysis classes. I am familiar with calculus at every level: from the basic differentiation and integration, to real number theory, the logical details of Reimann integration, sequence and series theory, and beyond. I strive in my own work for deep conceptual understanding. As Richard Feynman said, if you can't explain it in plain English, you don't understand it. I can help impart the deep understanding that will allow you to do well on exams, not just homework. I've taught algebra, pre-calculus, and calculus to many students over many hours, and I know exactly what foundations are critical for success in further math courses. There is no substitute for great preparation when a student enters a calculus course. I'll make sure that you or your student has learned, understood, and can make use of the necessary concepts. I have a B.S. In Math, am starting a Math PhD next year. I have strong proof and logic skills. Specifically, I have earned a computer science minor, in the course of which I took an honors discrete math and theory of computation course. I earned a B+. I have familiarity with discrete structures, recursive definitions, and most importantly, the logic and proof techniques underlying discrete math, like proof by induction, propositional calculus, predicates, quantifiers, implications, etc. These techniques are used throughout math, and I have high proficiency, and deep conceptual understanding. I have taken two linear algebra courses at the college level, and introductory course for physics/engineering/math majors at the 200 level, and an advanced, proof based course at the 500 level. I received A's in both classes. Linear algebra is the foundation of much of higher mathematics, like real analysis, so I get continued practice with this subject as I prepare for my math PhD. All of proof-based mathematics lies atop of first order logic, that is, propositional logic with predicates, and quantifiers. This language has become natural to me in the course of earning two B.S. degrees in Math and Physics. I successfully completed the most difficult logic and discrete math class available at my university, and now tutor other pure math majors taking the same course. Logic courses are often taught in the context of discrete structures, the theory of computation, or algebra and number theory. My experience in these tangential subjects helps students to succeed in their particular classes. I am taking Advanced Calculus (a very proof heavy class) and Russell has done an amazing job explaining the difficult concepts in a clear and concise manner. He is always willing to go back and ensure a previous concept has been mastered before moving on. Overall an excellent tutor and I would highly recommend him. Russell picked up on what was going on with my jargony, complicated text very quickly, It takes mastery to be able to identify these concepts in all the various ways they can be presented so quickly. I am looking forward to my second session with him. If you want to learn how to advance to the next to the theoretic level in math and understand the proofs, Russell is your tutor. This is my third lesson and we are progressing rapidly. If he asks a question and student doesn’t understand he is very good at reasoning in a different way. Very good at taking problems apart and excellent at explaining until student understands. increases student confidence. Working with Russell has been great. We started meeting at the library and have switched to video, which I did not think will work but has been great. He is very smart and really helps with understanding the problems. Rusell was a life saver! As my son's SAT subject tests were fast approaching he realized he needed some concrete help that no amount of studying on his own was going to accomplish. We found Russell a few weeks before test day and my son spent several hours (6 I think) online with him. He is now feeling confident that he has the tools to do as well as he is capable, and he loved working with Russell. I would absolutely recommend him and don't hesitate to utilize the online option, it's actually extremely helpful. Before I meant with Russel I was failing my college calculus class. Starting from what seemed like ground zero, he helped me slowly climb my way up to a passing level. The learning stated off slow, but as I gained confidence the lessons went smoother and smoother. He also provides external links that help out tremendously. Russel is a must have for a tutor and I strongly recommend him. Russell did a great job helping my sonoutbwith calc 3 and helping him make connections between the math and the real world/physics connections. We will definitely schedule more lessons. 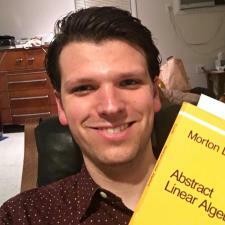 He is very knowledgeable about the specific definitions of linear algebra terminology, and how they all connect together. It was very easy to learn from him the abstract-ness of proving theorems and concepts, especially because he takes time to break it down to its lowest level. It was very easy to understand linear transformations, vector spaces and subspaces after he explained them all by definition, and broke it down to its most basic components, and even provided a plethora of examples and practice problems. Russell is also competent in tutoring in general. He understands that the student should be in charge of directing where the session should go, and that the tutor is not an answer key; the tutor is a guide toward the right direction, through asking questions, doing practice problems with the student, and allowing the student to ask questions about a broad, general area of the subject, rather than simply spending a whole hour explaining a concept and not allowing the student to ask to shift gears to another topic when need be. Overall, Russell is a very helpful tutor in Linear Algebra, and in general, an easy person to converse with while in session.